One of my favourite days on our Europe trip this summer was this one! 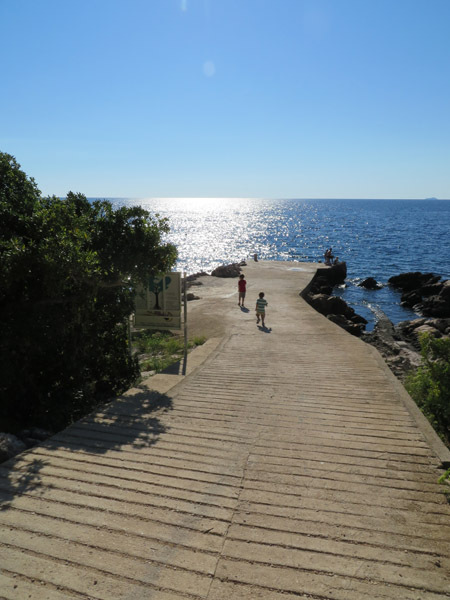 I had read about Lokrum and heard that it was a must see when you travel to Dubrovnik, Croatia. Well it certainly didn’t disappoint. 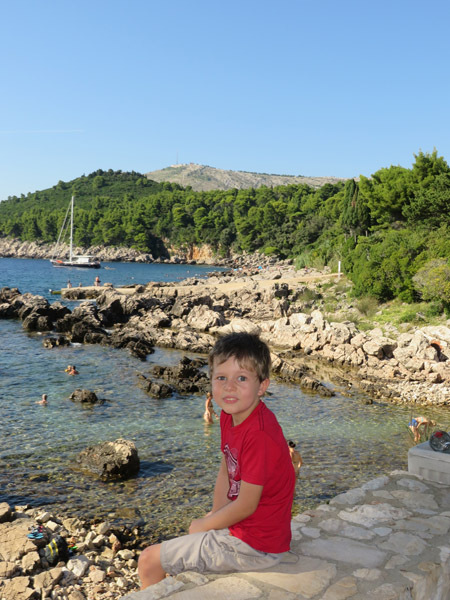 We headed down to the port and bought tickets out to the island of Lokrum. It takes about half an hour to get from Dubrovnik to Lokrum and costs around 10 euros per person (return) The ferry is smooth and comfortable which was a bit of a blessing as I get sea sick quite easily. 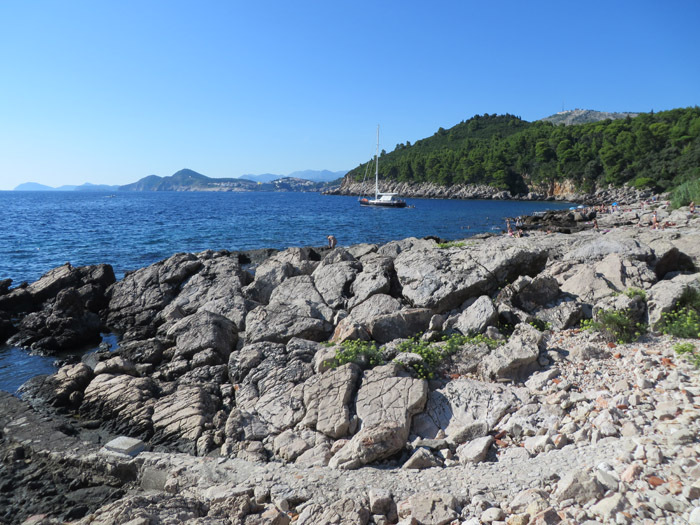 Sailing into the little Lokrum Beach port is quite beautiful. You go past little coves and bays, the water is perfectly clear and filled with sparkling diamonds! We hopped off the boat and decided to walk around the island. It kind of reminded me of Rottnest Island in Western Australia as it was very remote, rural and natural. There weren’t many restaurants or cafes, nor were there many places to stay. I think they had a hotel and a couple of guest houses, plus a camping ground and that was it. It was nice to be in a place that was a little more simple and not catering to mass markets like on mainland Croatia. The island is absolutely magnificent, everywhere we walked we were surrounded by beautiful, tall, green trees and gorgeous bays, even when you are in the middle of island you could still sometimes see little glimpses of the Adriatic through the forrests. Then we found a lake in the middle of the island. It was beautiful. Crystal clear and it had a cave in the corner. The water was cool and refreshing and we all swam out to the cave. To be a little honest it was a bit scary. It was very different inside and it got dark quite quickly, but it was exhilarating and totally worth it! Tom was so proud of himself as he swam all the way there and back (and trod water for 10 minutes inside) by himself. We carried Milo on our backs. Here is one of my favourite photos that we took of my beautiful Tom! We found a great little ‘old school’ playground for the kids, complete with an exercise area for the adults. The kids chased peacocks and bunny’s around and Scott and I wondered if we might have actually accidentally landed in Utopia! All of the best days end with an ice-cream (or a cocktail) and then we hopped back on the boat and headed back to Dubrovnik Harbour. Milo found a little peep hole in the boat on the way home that was perfect for his size! 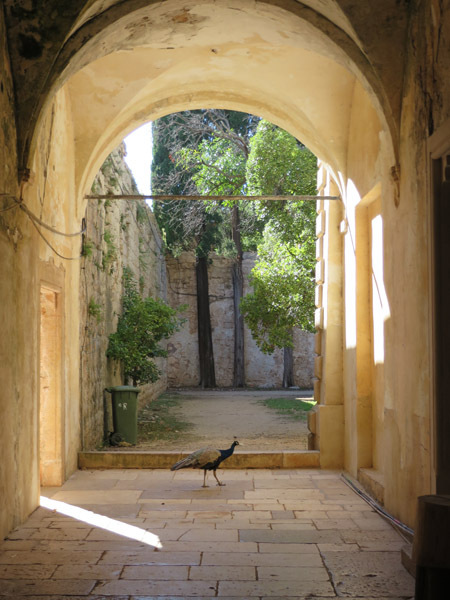 This was one of my favourite photos we took on our trip. The boys had ‘finally’ made it to the other side of the island (it is not that big but to them it was huge) and they spotted the sea. This is them running toward the Adriatic, squealing with excitement. After we landed in the port, no less than a few hundred meters away I stumbled across a take away Mojito stand (can’t make this stuff up) which, as far as I am concerned, should be a fixture in every town. It was a fabulous cocktail, made even better by the fact that I could drink while I went shopping. We found a gorgeous little restaurant on the bay and once again I ordered grilled squid. Scott and the boys also loved their meals. It was all topped off by ordering the recommended desert of Baked Custard. We were full but the waiter insisted we tried it. I am so glad I did. It looked and tasted just like my Grandma’s. It was such a treat as she passed away in 1997 and when I was little she would come over for dinner once a week and bring me creme caramel and Jelly for my brother. I had forgotten how much I loved it and I was instantly filled with lots of lovely memories of my Grandma!